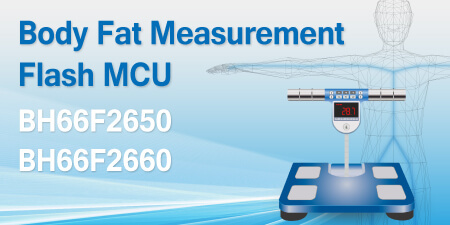 Following the successful previous release of its four-electrode AC body fat scale, HT45F75/77 devices, Holtek is now delighted to announce the release of its new eight-electrode AC body fat scale Flash MCUs, the BH66F2650/60. Eight-electrode body fat scales are used to measure body fat including legs, arms and torsos measurements which can reflect the body condition. These devices support both AC body fat and weight measurements, which are more accurate means of measurement when compared with traditional DC fat scales. With regard to how the measurement data is displayed, the body fat and weight information can be transmitted to a mobile phone by using the internal SPI/I2C/UART serial interfaces and an external bluetooth module. The data can also be displayed on an LED Panel using the internal LED driver. The devices provide an AC body fat measurement circuit, an LED driver, LDO, PGA and a 24-bit Delta Sigma A/D Converter. With this high level of functional integration, the required number of external components is greatly reduced which will result in reduced manufacturing costs and improved productivity. The devices include 8K/16K words of Flash Program Memory, 256/1024 bytes of Data Memory, 64/256 bytes of True Data EEPROM, IAP (In-Application Programming) function, Multiplication Division Unit and Timer Modules. With regard to packaging, the devices are supplied in 48-pin LQFP package types. To support these new devices, Holtek supplies a full suite of excellent hardware and software development tools including the HT-IDE3000 and ICE (In-Circuit-Emulator) which include trace analysis features, breakpoint setup as well as a host of other functions. The Holtek's e-WriterPro also provides a means of ICP (In-Circuit Programming) to allow for fast program updates during development and ensure developers have their designs up and running in the shortest time possible.